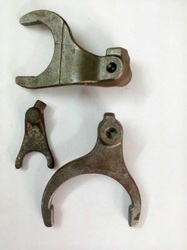 Manufacturer of a wide range of products which include shifter fork forging. We have emerged as one of the leading manufacturer and supplier offering Shifter Fork Forging to our clients. Our offered machine part is precisely designed using premium quality raw material and modish technology by our skilled professionals. Our provided machine part is widely used for moving of gear in various automobiles. Using highest grade of raw materials sourced by our vendors, we manufacture and design the product using advanced technology.